I've said it before, I like gravestones. A few days ago I started using the Billion Graves app on my Android tablet to photograph and upload pictures of gravestones in Barnsley cemetery to the Billion Graves website. I wrote a blog post about using the app and the Billion Graves people have been kind enough to link to the post on their social media. I was wondering how many blog posts I'd written about gravestones, or which included gravestones, so I decided to use the label facility on Blogger to tag my posts. I've tried to keep the list of labels or tags (it seems they are pretty much the same thing, it just depends which blogging platform you use) fairly short for simplicity. You can set the labels to display as a cloud, so that the ones with more posts appear in larger font than the ones with fewer posts. And you can add more than one label to a post, or none if you wish. 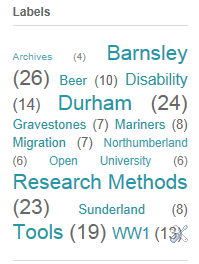 Having gone through my posts to date it looks like I have just seven posts which include gravestones, the category Research Methods is the third most popular after the obvious Barnsley and Durham tags. (I did wonder about just having a North East tag ... but the advice on Geneabloggers was to avoid combination tags) I've defined Research Methods as those posts where I talk about searching for information on ancestors in various different ways, cross referencing sources and making sure the facts all fit for example. 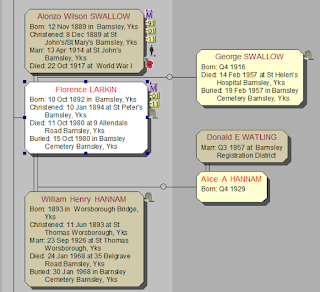 The category Tools is for when I write a post that talks about using some kind of computer software or a particular website, such as Billion Graves or Family Historian, my family tree programme. I've set the labels cloud to display on the left hand side of my blog - once the Archives reopen on Thursday next week I will remove the ticker and everything on that side will move up a bit. So it won't be as crowded as it looks at the moment. I start by opening the image in Adobe Photoshop and cropping it down to the relevant part, trimming off the OH's feet for example and removing surplus background. Sometimes I take an additional picture of the gravestone in situ, to help find it again or if it is particularly decorative - I can save more than one picture to a source - but we'll get to that in a moment. If the inscription is difficult to read I use the various tools on Photoshop to try to make it clearer, changing the brightness and contrast and so on. 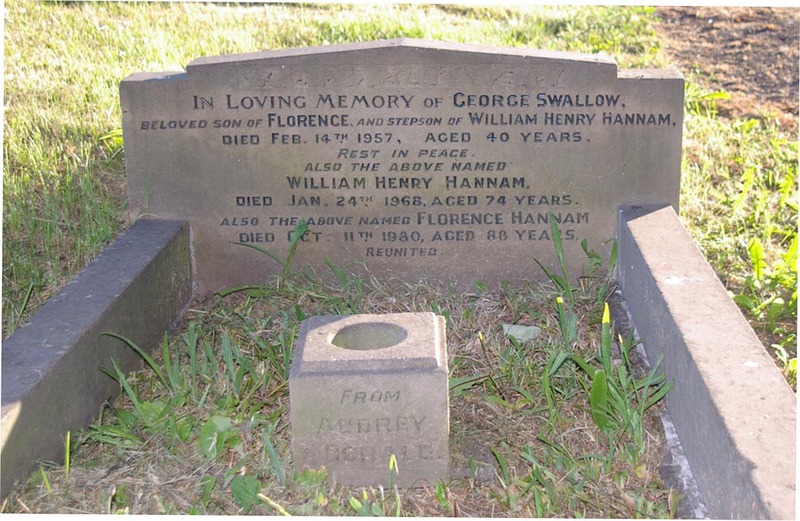 Once I am happy with the picture I save it to the Gravestones folder within the Media folder for the OH's tree with a meaningful name such as 'Swallow and Hannam', the surnames shown on the stone in the photo above. Within Family Historian I then find the first individual named on the stone and display a section of their family tree, hopefully showing everyone included in the inscription. Florence Larkin was married twice, firstly to Alonzo Swallow, who died in the First World War and secondly to William Henry Hannam. I've just discovered that labels also make it easier to find a blog post in the Blogger dashboard so you can copy the URL to make a link here to the older post. I just used the label WW1 to filter the relevant posts out of the 122 on my blog list - then it was easy to find the one about Alonzo. I suppose I could have used the search functionality on my home page too. 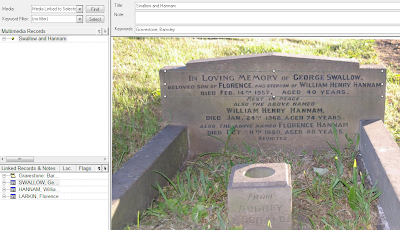 Selecting the three individuals that are named on the gravestone (holding down the CTRL key to allow me to select more than one) I can then add my 'Gravestone Photo' flag to the record. 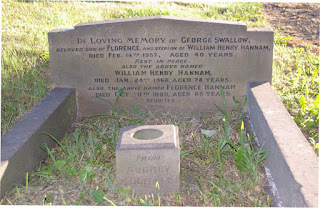 It looks like a little gravestone, and you will see that it is attached to Florence, William and George in the snip from Family Historian above. 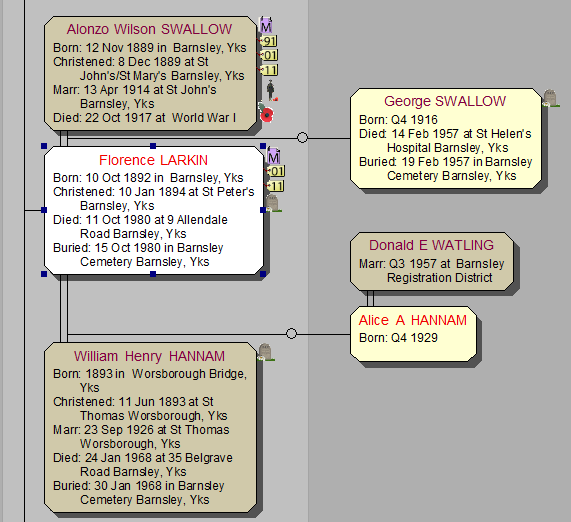 The other little flags tell me I have various census returns entered for Alonzo and Florence (yellow tabs with numbers), their marriage entry (a purple M tab), that Alonzo was a soldier in WW1 (a little Tommy ion) and that he was killed or died during a war (a poppy). Opening the image in the multimedia window I can draw a box around the each individual's text on the stone and link it to their record - so now not only has the gravestone been cited as the source of the death date information for each person, but in each record there is a clipping of the gravestone image containing the appropriate text on the stone. This is the same technique that allows you to link the face of each person in a group photo to their own record. Finally opening the source record on top of the multimedia window I can transcribe the inscription into the Text from Source field on the source record. 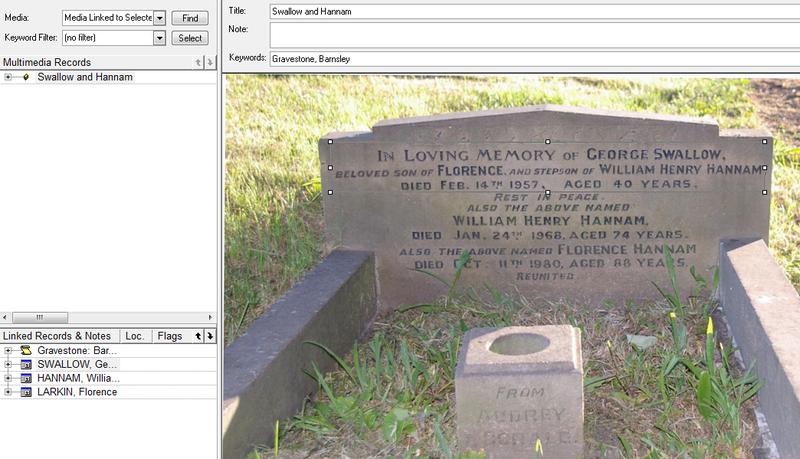 Since our trip around Barnsley Cemetery this week I've added a further stage to the process. 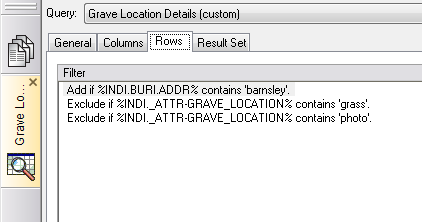 The plot and grave number for each person is recorded in their record under Grave Location - this is the information I used to print out a list of all the grave sites I knew of in Barnsley Cemetery before we went for our walk. I can now add the words 'photo taken' to the Grave Location fact in each person's record - if by any chance I hadn't already found their burial record ... if I had just come across the gravestone by chance and had not ever tried to find this person's burial I would have to look them up in the Barnsley Cemetery burials transcription to get the correct plot and number information and add that first. 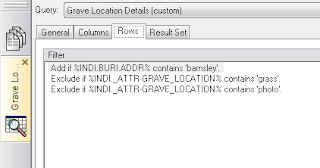 Now next time I go to Barnsley Cemetery I can run the Grave Location query excluding all the plots where we have already found and photographed the stone or that we have found and discovered nothing but grass (as I have annotated them with the word 'grass'). It is all very scientific and therefore it's bound to go wrong! We did find one gravestone, the one for ex-soldier Riley Smith, whose First World War story I wrote a few days ago which only contains his name, despite the burial records stating that his wife Lily is buried there too. Maybe the family couldn't afford to have Lily's name added to the stone?